Kein Notebook in dieser Preisklasse ist schöner und ausdauernder als das Acer Aspire 5810T. Eine klare Kaufempfehlung also für Anwender, die ein günstiges und sparsames Notebook mit großem Display suchen. Allerdings ist das Rechentempo des Acer Aspire 5810T selbst zu diesem niedrigen Preis nicht konkurrenzfähig. Vor dem Test fragte sich die Redaktion, in welche Kategorie der 15-Zoller mit CULV Prozessor eingeordnet werden soll. Office-Notebooks oder Subnotebooks? Das Gewicht von 2.4 Kilogramm sprach gegen die Office-Kategorie. Die geringe Leistung ließ jedoch eine geringe Bewertung erwarten. Gegen Office-Laptops mit starken Intel Core 2 Duo CPUs hat der 5810T in Sachen Geschwindigkeit keine Chance. Slim and sleek for a 15.6in laptop, and good-looking too, but the Timeline 5810T just falls short of a recommendation. The Timeline 5810T's biggest problem, though, is the competition. It may have good battery life, ergonomics and surprising portability for such a large-screened laptop, but others here are capable of putting in a more intensive shift, and we can't recommend the 5810T. With the Aspire Timeline 5810T, Acer has put together a pretty slick machine for under $600. Although you’re not going to use the 5810T to edit video or play the latest games, it’s more than adequate for watching a DVD and performing other everyday tasks. The MSI X600 provides more muscle in an equally svelte system, but that notebook costs $250 more and omits an optical drive. Despite the 5810T’s low benchmark scores, its light weight and long battery life make it one of the most portable 15.6-inch notebook on the market—and at $548, one of the most affordable, too. We'll leave it to economists and pundits to sort out whether this is indeed the worst economic downturn since the Great Depression. What we do know for certain is that we’re all making sacrifices: cutting our spending, saving more, and searching for deals. At ComputerShopper.com, we’ve seen an undeniable surge in interest—from both readers and sellers—in low-cost computers, and part of that wave is the Aspire Timeline series from Acer. This budget laptop will please business productivity-app users who need long battery life, but performance-conscious buyers should opt for a machine with more pep. Maybe not the most powerful of laptops, the 5810T's battery life is ahead of the pack Though the Acer 5810T boasts a large 15.6 inch screen, its light and thin build means that you won't be bogged down by this laptop when you're taking it out and about. Overall this is a nice, reasonably powerful laptop, whose light weight and large battery life means it is a great companion for working on in the great outdoors. Acer once again shows off the potential of Intel's CULV processors with its conservative-looking Aspire Timeline 5810T-354G32Mn. Some of the best battery-life we've seen on a 15.6in laptop joins superb build quality, intelligent design and good ergonomics to form a generally well-specified laptop that is only held back in intensive usage and HD entertainment by its single-core Core 2 Solo CPU. It's still a decent laptop, but if true portability is what you're after, you're better off with the 14in or 13.3in models in the Timeline range. Acer has now released three laptops based on Intel's nascent CULV platform. Shipping with 13.3in, 14in, and 15.6in screen sizes, the Timeline series takes in either the single-core SU3500 or dual-core SU9400 chips sat on top of a GS45 motherboard, complete with a choice of integrated X4500MHD graphics or a Mobility Radeon HD 4330 card for better on-the-go gaming. 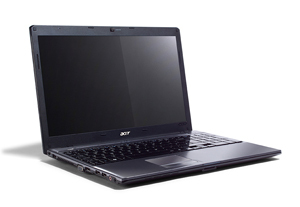 Acer should be onto a winner with the new Timeline series, if this 15in Aspire 5810T is anything to go by. It’s usefully light, has a great range of practical features such as 802.11n wireless, DVD writer, USB ports aplenty and digital video out. The 15.6in widescreen display belies the notebook’s weight of just 2.3kg, and with a power efficient dual-core processor at its heart, it runs at over twice the speed of the fastest netbook so can actually chew on creative tasks. But best of all is that remarkable battery life figure of over nine hours of real productivity. Finally we have an affordable all-purpose laptop we can carry anywhere – and leave the charger at home for the day.